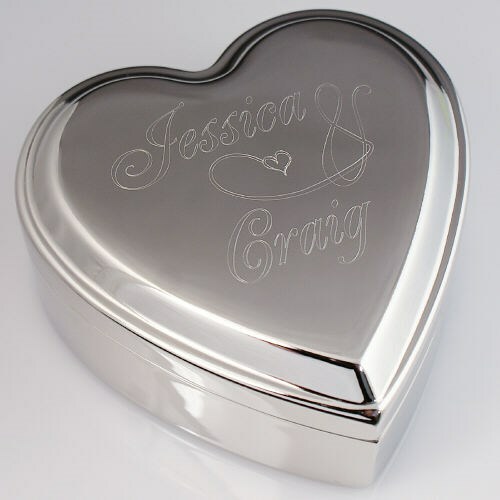 Give her a gift of love and commitment when you present her with this attractive Engraved Couples Silver Heart Jewelry Box. Perfect for a Valentine's Day gift, a birthday gift, or just because. Your Engraved Silver Heart Jewelry Box is a heart shaped jewelry box with a bright silver-plated removable top and bottom. Inside of the heart features soft, blue felt to protect your precious jewelry. Measures 3 1/2"L x 3 1/2"W x 1 1/2"H. Includes free personalization! Engrave your Silver Heart Jewelry box with any two names. Additional Details Shop 800Bear.com for all of your romantic Valentine's Day Gift Ideas. We also offer a stunning selection of Valentine's Day jewelry that she'll be thrilled to wear.